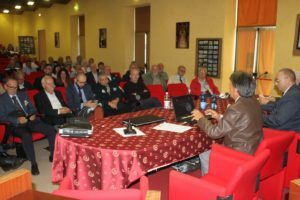 17 Settembre 2017 – W.A.P. 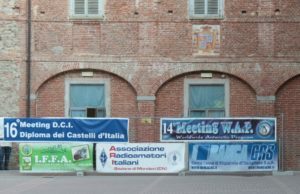 Great time this morning at the 14th WAP Meeting managed by ARI section of Mondovì in the North West side of Italy, not too far away the French border. Held in the frame of Vicoforte, a wonderful site at the foot of the Alpes, we were inside an architectural gem just aside the Vicoforte Basilica, known for having the largest elliptical cupola in the world. Over here we did talk about DX, Italian Castles and Antarctica. Nearly 40 years of Antarctic passion … 40 years of continuous work is a long time, and undoubtedly this is a great goal. (on the 2nd pic aside, L to R: the President of ARI Mondovì IW1EVQ Prof. Edo Ambrassa, IK1GPG Max, I1HYW Gianni). 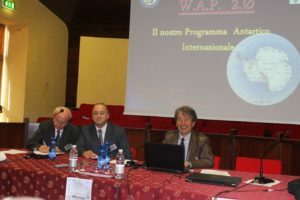 This year, on the lecture, we have officially presented WAP 2.Ø our brand new looking Web site fully dedicate to Antarctica; presentation has been done by Gianni I1HYW and Massimo IK1GPG. Guests from almost all the Italian call areas, and Hams from some EU Countries.. 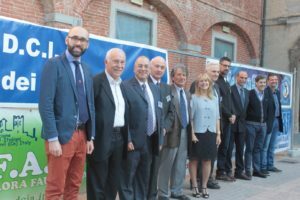 Authorities present: Luca Robaldo, Councilor of Mondovi City, Dr. Marco Botto President of an important local Company, Graziano Sartori, ARI Vice President.